KKTR, a National Public Radio affiliate licensed to Truman State University, has been awarded a $78,000 grant from the Corporation for Public Broadcasting to initiate Hybrid Digital (HD) radio broadcasting. The grant will cover approximately 80 percent of the cost of converting the transmission plant to digital broadcasting. Mark Smith, assistant professor of communication, who prepared the KKTR grant under the supervision of former dean Heinz Woehlk and Clark, noted that a digital receiver is required to hear the HD broadcasts. “KKTR will continue to be heard on existing radio receivers, however, digital broadcasts may only be heard on a special HD receiver,” said Smith. The HD system features multiple streams of broadcast programming. Before year’s end, Kirksville listeners will be able to access music and information on KKTR and KKTR2, which will be fed from KBIA, Columbia, Mo., an NPR affiliate in central Missouri. The main KKTR digital channel will duplicate the current analog programming received from KBIA; KKTR2 will offer separate program services for northeast Missouri listeners. KKTR listeners can access the KBIA Web site for HD radio facts and view digital radio models. In addition to KKTR digital broadcasts, student media station, KTRM, 88.7 has been granted funding by the Truman State University Board of Governors to covert its transmission plant to HD broadcasts. Smith noted that KKTR and KTRM will be the first HD radio stations in northeast Missouri. Finally, Truman has received permission from the Federal Communications Commission to expand the transmission power of KKTR and KTRM from the current 1,000 watts to 3,500 watts, per station, effective with the HD installation. The power increases will double the geographic range of both stations. The Truman stations are expected to begin HD broadcasts this fall. A group of faculty and students involved in Truman’s National Science Foundation (NSF) supported interdisciplinary training program in mathematical biology were in San Jose, Calif., from July 31-Aug. 4 to share the results of their work and to learn about the work of others. A group of 16 Truman students and faculty members from mathematics, biology and computer science interacted with others from the life and mathematical sciences at a conference dedicated to work at the intersection of the two sciences. The conference was an annual gathering of the Society for Mathematical Biology which this year was held jointly with the Japanese Society for Mathematical Biology. Leeds represented Truman’s program in a minisymposium dedicated to the work of schools that have received similar NSF funding. Through his invited talk, “Spatiotemporal analyses of the abundance of Missouri bladderpod (Lesquerella filiformis): conservation of a rare plant species on federal land,” he conveyed to the audience the program’s high expectations and high level of achievement as well as how seriously we take interdisciplinary work. This material is the result of work supported by the National Science Foundation’s Interdisciplinary Training for Undergraduates in Biology and Mathematics program under Grant No. 0436348, “Research-focused Learning Communities in Mathematical Biology.” Information about Truman’s Mathematical Biology program can be found online at http://mathbio.truman.edu and by contacting Miller at millerj@truman.edu. Two students in Truman’s Mathematical Biology program tied for the Best Poster Presentation award at the annual meeting of the Society for Mathematical Biology. Elise Walck, a junior biology major from St. Charles, Mo., and Tracey Blasingame, a junior mathematics major from Belvidere, Ill., will share the Society for Mathematical Biology’s first Best Poster Presentation award for undergraduate research. Their posters tied for the award in competition with 22 other posters a the competition. Both posters communicated results obtained with teammates in Truman’s “Research-focused Learning Communities in Mathematical Biology” program. Walck’s poster, titled “A Cellular Potts Model of Caenorhabditis elegans Embryonic Development in the Four-Cell Stage,” communicated the work of Tim Walston, assistant professor of biology; Scott Thatcher, associate professor of mathematics; Clayton Davis, a senior mathematics and computer science major from Chesterfield, Mo. ; and herself. Blasingame’s poster, titled “The W Statistic: A New Approach for Testing the Relative Abundance Structure of Communities in a Pylogenetic Context,” communicated the work of Jon Gering; associate professor of biology; Dean DeCock, associate professor of mathematics; Bryan Hartwig, a junior mathematics major from Lee’s Summit, Mo. ; Nathan Whelan, a senior biology major from Eureka, Mo. ; and herself. This material is the result of work supported by the National Science Foundation’s Interdisciplinary Training for Undergraduates in Biology and Mathematics program under Grant No. 0436348, “Research-focused Learning Communities in Mathematical Biology.” Information about Truman’s Mathematical Biology program can be found online at http://mathbio.truman.edu and by contacting Jason Miller, associate professor of mathematics, at millerj@truman.edu. 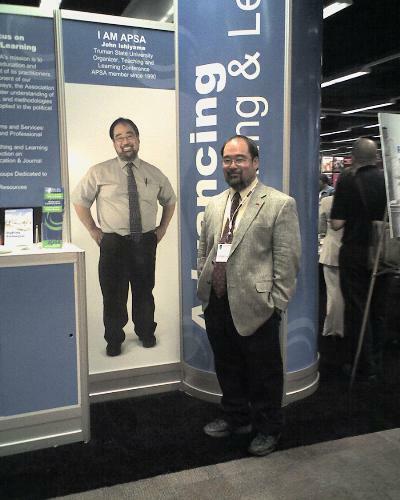 John Ishiyama stands next to his life-size image at the APSA meetings recently. A life-size picture of John Ishiyama, professor of political science, was highlighted at the American Political Science Association (APSA) meetings Aug. 30-Sept. 2 in Chicago. Ishiyama was highlighted with the image announcing “I am APSA,” plus his university affiliation and his role in the association’s Teaching and Learning conference. The life-size image was in the central portion of the exhibition hall, where book publishers had their booths, where publishers hosted receptions, and where the association provided free coffee for the conference attendees each morning. There were four such life-size images, and Truman had the honor of having one of its political scientists included among those four. After just its first week, Truman’s United Way campaign reached slightly more than $23,200. The United Way thanks everyone who has contributed. People really are making a difference for these agencies. For example, by donating less than $1 per week (or $50 per year), you provide transportation to Columbia for two families’ medical needs, groceries for a family of four for one week in the shelter, dues sponsorship for two 4-H club members, or training for five to six volunteers who assist area seniors with the Missouri Property Tax Credit (which last year alone returned more than $95,000 to seniors in the Kirksville community). This week’s FAQ is a two-part question that people sometimes hear. A: If you gave through payroll deduction last year, you can check your donation amount at any time on TruView. Under the Employee tab, check your pay stub for the amount listed under “Benefits and Deductions” as going to the United Way. Because the current campaign is actually for the 2008 year, the amount you pledge in the current campaign will not be deducted until your January 2008 paycheck. If you gave last year via check or cash, you can contact Brad Chambers in Admission at 785.4114, Teri Heckert at 785.7530, or Nancy Pennington at the United Way office at 665.1924 to find out the amount you contributed. TruNews has formally changed its name to News Channel 36 KTRM-TV. The program is often referred to as News 36 in short reference. News 36 broadcasts a half hour program every Tuesday, starting at 5:30 p.m. Sept. 11 on Truman Channel 36. The broadcast will re-air at 9 p.m., 10 p.m. and 2 a.m.
News 36 will be rebroadcast Wednesdays at 7 p.m. and Thursdays at 3 p.m. on CableOne Channel 3, the Kirksville public information channel. News 36 covers state, local and campus news. Please send questions, tips or story ideas to News36@truman.edu. Blue Key and Cardinal Key are sponsoring a blood drive. All blood types are needed, but O negative is desperately needed. People can make appointments online at http://www.givelife.org. Students need to see a professor in their major to be nominated. E-mail careers@truman.edu for more information. The Career Center staff and career assistants welcome students back and hope they are having a great semester. It is the time of year to start thinking about Career Expo which is coming up from 1-5 p.m. Oct. 10 in the Student Union. Interviews for full-time positions and internships are Oct. 11 in the SUB. Stay tuned for more information about specific events during the next couple of weeks including a new program on Oct. 3 called “Career on the Quad” which helps students prepare for Expo. One of the first things to do is create or revise your resume. Right now a group of career assistants is available without appointment to help students with this important piece of the job search process. Pizza will be provided at this meeting. Applications are available online at http://career.truman.edu/student/internship/mogov_app.pdf. Friday • 8:30 a.m.-2 p.m.
Stop by the office in McClain Hall 303 to make an appointment or call 785.4484. Pickler Memorial Library offers a service whereby patrons can be notified via e-mail when new materials matching a particular interest are received. For instructions on setting up this e-mail alert, contact the Reference Desk at 785.0451 or e-mail Ask-A-Librarian at asklib@truman.edu. Both boys and girls ages 8-19 are encouraged to audition for the 56 roles to be cast by Minnesota Ballet’s Artistic Director Robert Gardner. Girls need to bring ballet shoes (and pointe shoes, if applicable) and wear tights and leotards. Please secure long hair in a bun. Boys should wear ballet shoes, a tight-fitting T-shirt and athletic pants. Staging for the performance will occur the same day from 1-6 p.m. in Baldwin Auditorium. Dancers will be given a specified time to rehearse their assigned role(s). Some dancers will rehearse between 1-3 p.m. Sept. 23 in Baldwin. sometime between 1-4 p.m. in the Pershing Building Dance Studio. Some Sunday afternoons may be utilized also. "The Nutcracker" will be performed with the Minnesota Ballet Company at 7:30 p.m. Dec. 4 in Baldwin Auditorium. There will be a full dress rehearsal with the company on Dec. 3 during a time to be announced. Contact Melody Jennings at 785.7259 or jennings@truman.edu for more information. Apply now to serve as the 2008-2009 student representative to the Board of Governors. Applications are available online at http://governors.truman.edu or in the CSI and are due no later than Sept. 15. Applicants must be a Missouri resident. If you have any questions, e-mail truman.student.rep@gmail.com. Tom Capuano, professor of foreign language, presented a paper on a 16th-century Spanish text on pharmacy called “Compendio delos boticarios” at an international conference in Foggia, Italy, May 25-26. The conference, titled “La Scienza della Salute e l’Intercultura” was co-sponsored by the City of Ascoli Satriano, the Universita degli Studi di Foggia, and the Italian Ministry of Health. The course syllabus for the Senior Seminar class in sociology and anthropology, and the research paper assignment, which were jointly developed by Elaine McDuff, associate professor of sociology, and Amber Johnson, associate professor of anthropology, have been included by the American Sociological Association in the 2007 edition of their teaching resource, The Capstone Course in Sociology. Betty McLane-Iles, professor of French, in collaboration with Larry Iles, had their article “England Drama 1980-Present” included in the recently published The Columbia Encyclopedia of Modern Drama. More than 450 leading scholars contributed to this reference published by the Columbia University Press. The men of Delta Chi at Truman received numerous awards from the Delta Chi Leadership College this past summer. Chapter awards include Outstanding Web site, Outstanding Scholarship, Outstanding Ritual and Ceremony Programming, Outstanding Recruitment, Outstanding Housing Corporation, Outstanding Community Service, Outstanding Alumni Newsletter, and Outstanding Alumni Board of Trustees. Individual awards were given to those who exhibited excellent character in the positions. Mark Lowry received the “BB” award as Truman’s Delta Chi chapter adviser. Joe Nedelec, instructor in justice systems, received the Faculty Adviser award. Blake Meyer, a senior nursing major from Jefferson City, Mo., received the Marge Lee Outstanding “C” award as Truman’s Delta Chi secretary. Matt Wright, a junior from Jefferson City, Mo., received the Outstanding “E” award as Truman’s alumni secretary. Finally, the chapter was awarded the prestigious President’s Cup, given to the few select chapters exhibiting overall superior performance and programming. The department of communication is proud to welcome television producer and stand-up comedian, Karith Foster to Kirksville. She will be performing at 8 p.m. Sept. 10 in the Student Union Building Georgian Room A. Seating will start at 7:30 p.m. and there is no cost to attend the event. Foster has worked on television programs such as “The View” and has performed on Comedy Central and NBC’s “Last Comic Standing.” She has performed live in clubs across the country, such as Caroline’s. Foster will also speak to students in JINS 356: The Art and Science of Humor and in COMM 355: Broadcast Production Sept. 11. The Student Recreation Center will continue celebrating its 10 year birthday by running a display of former staff pictures, wacky facts about the center, and construction scrapbooks from Sept. 10-12 inside the Student Recreation Center. The Rec Center will be hosting a carnival from 3-5 p.m. Sept. 12. Games, prizes, cake and punch will be provided. The celebration will come to an end with a grand prize paper airplane toss in the main gym from 4:30-5 p.m. There will be an organizational meeting for a French play at 8 p.m. Sept. 11 in Baldwin Hall 284. Students who are interested in being part of this play should attend. Contact Patrick Lobert at 785.4062 or plobert@truman.edu for more information. Alpha Phi Omega will have open meetings for rush at 5 p.m. and 8 p.m. Sept. 12 and at 8 p.m. Sept. 13 in Violette Hall 1010. Alpha Phi Omega is a coed service fraternity. Contact Christy Yoder at 314.974.7921 for more information. The Weekly Lunch Series will take place from 12:30-1:30 p.m. Sept. 12 in the Student Union Building Alumni Room. Writing Across the University Committee will present "The Top 3 Challenges with a Writing-Enhanced Course-How Do You Deal?" Contact The Center for Teaching and Learning at 785.4391 or ctl@truman.edu for more information. An information session for those students who are interested in going to Cairo during winter break for two hours credit will take place from 5-6 p.m. Sept. 13 in Ophelia Parrish 2210. Those students who are unable to attend should contact Sara Orel at orel@truman.edu or 785.4419 before that date for more information and applications for the trip. Truman State University’s chapter of American Association of University Professors (AAUP) will meet for the first chapter meeting of the school year at 5 p.m. Sept. 13. All are welcome and encouraged to attend. Contact Betty McLane-Iles at 785.4507 or bmclanei@truman.edu for more information and location. The first Global Issues Colloquium of the academic year will feature Robert Hitchcock, professor and chair of anthropology at Michigan State University. He will present “Death by Myth? Climate Change, Politics, and Coping Strategies Among the San of Southern Africa” at 7 p.m. Sept. 13 in Magruder Hall 2001. Contact Linda Davenport at the Center for Teaching and Learning at ctl@truman.edu or 785.4391 for more information. Sigma Chi Delta, local social sorority, Fall 2007 Recruitment will begin with an informational night at 7 p.m. Sept. 13 in Baldwin Hall 303. There will also be open recruitment nights at 7 p.m. Sept. 17, 18 and 19. Recruitment nights on Sept. 17 and 19 will be in Baldwin Hall 303 and the recruitment night on Sept. 18 will be in Baldwin Hall 251. Contact Rachel Meyer and/or Taelor Cash at 573.353.2105 for more information. The Board of Governors will meet at 8:30 a.m. Sept. 15 in the Student Union Building Conference Room. Log on to http://governors.truman.edu/ to view the agenda materials and for more information. “Spicy” First Sunday Dinner is the kick off event for Hispanic Heritage Month. People will be able to experience authentic dishes reflecting the rich food traditions of Mexico, Spain and other Latin America cultures. This event will be free, but there are limited quantities of food: First come, first served. This First Sunday Dinner will take place from 5-6:30 p.m. Sept. 16 in Ryle Hall Main Lounge. Contact Laura Bates at lbates@truman.edu or 785.4142 for more information. Phi Sigma Pi will have a rush-informational meeting at 6:30 p.m. or 8 p.m. Sept. 17 in the Student Union Building Activities Room. Phi Sigma Pi is a coed national honor fraternity based on the ideals of scholarship, leadership and fellowship. Sophomores and first-semester juniors with at least a 3.0 GPA are eligible to rush. Events to follow the rest of the week. Contact Kelly Albright at 314.852.3856 for more information.